2 3/16" W x Approx. 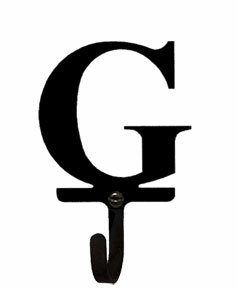 3 5/8" H x 1 1/4" D, Inside Hook Depth 1"
This wall hook and the letter G, of the alphabet, is created of wrought iron. The wall hook has a baked-on black satin matte powder coating for maximum moisture resistance.